Combine all dressing ingredients in a small microwavable mixing bowl with lid. Cover and cook on high 1 minute. Stir or whisk until well blended. Microwave another 30 -60 seconds if needed to blend well. Set aside.Prepare quinoa according to directions listed on package. 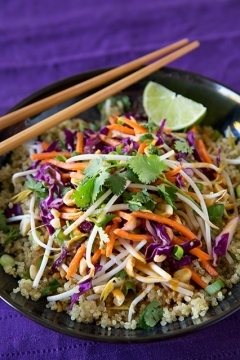 To assemble salad layer cooked quinoa, cabbage, bean sprouts, cucumber, green onions and peanuts. Garnish with fresh cilantro or parsley if desired. Drizzle with dressing to taste and serve. I ADJUSTED THIS RECIPE TAKING OUT A FEW INGREDIENTS I JUST WOULD NEVER HAVE IN THE CUPBOARD!